Who is ready for some high-profile MMA action? Legacy FC 30 will be live inside the Route 66 Casino just outside of Albuquerque this Friday night, April 4th, much to the delight of fight fans who have been needing to satisfy their MMA desire! Holly Holm will headline the first Legacy FC event in New Mexico and she will top a fight card stacked with local talent and intriguing match-ups. 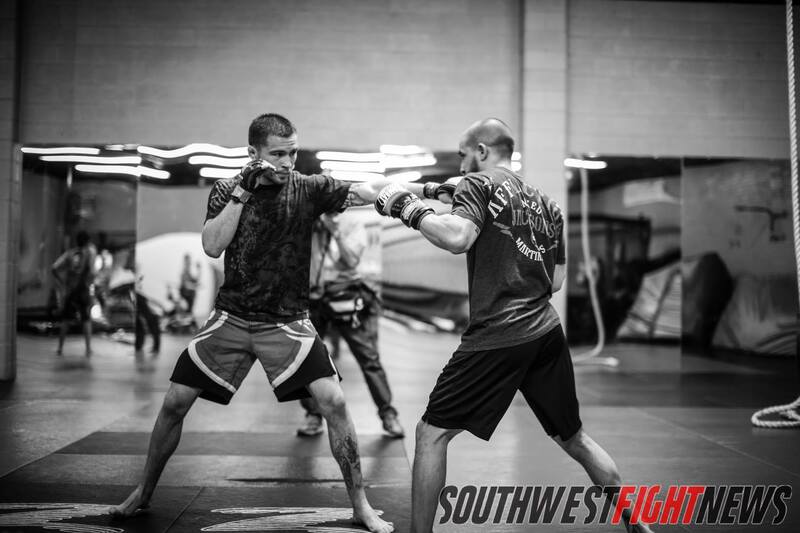 Today, Southwest Fight News brings you the fourth installment in our Legacy FC mini-series titled “Why Fight Fans Should Be Excited..” and in the first three we shared with you our thoughts as to why you should be stoked to attend or to watch this event. (Read part one, part two, and part three) Within the series we talked about Holm and her headlining bout, Adrian Cruz taking on Henry Briones and of course, the Lovato fighting cousins returning to the fight scene. For an additional read to prepare you for the event, make sure to catch our in-depth breakdown on the highly anticipated Flyweight duel between Ray Borg and Nick Urso. In this installment we will focus on a very recognizable face in the local MMA scene and one of the most successful fighters to ever compete on New Mexico soil. The Featherweight fighter will take on an opponent with more experience then he, which is truly saying something as both men will bring in nearly 100-fights of MMA experience into the cage on April 4th. When Albuquerque’s Donald Sanchez and Brazil’s Flavio Alvaro step into the cage on Friday night, the fighters will bring in 98-professional MMA bouts of experience, 75-career victories, 27-submission victories, and 26-knockout victories. Combined, the two Featherweights have a finishing average of 71% and let’s be honest, when will you ever see so much experience inside the same cage? Donald Sanchez embodies the very essence of New Mexico MMA as a staple of our state’s fight scene for over nine years. Since his professional debut in December of 2005, Sanchez on average has fought a busy schedule for those averaging a fight every 2-3 months. Capturing the King of the Cage Title during that time, Sanchez was one of the most recognized fighters competing in New Mexico. As his record built to an impressive level, Sanchez would find himself competing against top ranked opponents like Tatsuya Kawajiri and Hatsu Hioki in oversea bouts. Now representing the Jackson-Winkeljohn gym, Donald Sanchez will end his longest career lay-off with a co-headlining bout against the experienced Brazilian, Flavio Alvaro. Sanchez as many know, trained for years at the FIT NHB gym under the tutelage of Tom and Arlene Vaughn. During the several years spent there, Sanchez would capture KOTC Gold, travel overseas for marquee fights and become one of the state’s iconic fighters. In a bit of shocking announcement, Sanchez would leave the gym after his last outing and joined the team over at the Jackson-Winkeljohn gym. The effects of the change of scenery have not been seen yet since this will mark his first fight since the move and it will also mark his longest layoff in his professional career. Sanchez won a split decision over a tough opponent last July at Bellator 97. Sanchez has always been a very durable volume striker who imposes his will with aggression and powerful strikes. Possessing a very diverse striking arsenal, Sanchez has accurate lead strikes and to compliment his impressive combination striking, Sanchez has very solid kicks and knees that target the legs, body, and head. While Sanchez has typically been known to be a striker who has the ability to finish the fight when his opponent succumbs to strikes, Sanchez does have several submission victories on his resume. The lead knee or flying knee may be the trademark move of Sanchez and his Muay Thai roots have allowed him to capitalize on the inclusion of elbows to make his attack a true eight-limb onslaught. It will be interesting to see Sanchez inside the cage after spending time working with the coaches from the Jackson-Winkeljohn gym. His talents already made him one of the best regional fighters in New Mexico and his fight with Alvaro will be a step-up not only in terms of opponent but in level of bout promotion. His last fight was a dark match at the tail end of a Bellator show and his fight Friday night will be the co-main event on AXS TV as part of an event that will be watched by many notable names within the MMA community. Team Legendary’s Flavio Alvaro is the type of fighter you’d expect when you realize he is from the Sao Paulo, the home of so many elite level fighters. With 56-fights beneath his belt, experience comes second to very few and his workload mirrors his opponent as he has been in the sport for nine years. Alvaro’s martial arts roots in Brazil are just as his nickname and gym affiliation suggest, they are “Legendary”. Alvaro competed in four one-night tournaments in his young career including fighting for the infamous Rio Heroes promotion where the fights were without round limits and did not require the usage of gloves. Essentially the Vale Tudo fights were underground bouts. When fight fans think of old-school Vale Tudo, one may bring up the name Wanderlei Silva and Alvaro encompasses that very aggressiveness and ferocity. Alvaro can swarm an opponent early and has the vicious intent to finish an opponent when he smells blood. Alvaro is seen in several career outings as patient and methodical, awaiting openings, but as soon as he finds one, Alvaro is powerful in his attack. If that doesn’t make Alvaro dangerous enough, he also has very solid wrestling skills; Alvaro is very technical in getting his opponent’s back along the cage where he is strong in his takedown efforts. His Jiu Jitsu is crafty as well, Alvaro has finished the majority of his career victories via submission. This fight has huge implications for the winner. While most fighters end-goal is to get to fight within the ranks of the Ultimate Fighting Championship (UFC), these two fighters are closer than most. The UFC is currently in full expansion in the country of Brazil and recently announced their first show in New Mexico; Sanchez and Alvaro represent both of those markets and a win Friday night very well may push the hand of the UFC to feature one of these fighters. For Alvaro, it will be a career well-spent as after 50-fights, his fight talents will be featured on the big stage of MMA. He is currently on a 5-fight win streak, winning ten of his last eleven overall. Sanchez is on a winning streak of his own, winning his last four and seven of his last eight overall. With the UFC’s debut event coming to Albuquerque, the show will definitely fill the card with local talent. They have already signed teammates of Sanchez, John Dodson and Diego Sanchez to represent the area and Sanchez would be a great addition as he has always been one of the top local draws. Sanchez has flirted with a big signing in the past, with win streaks of four, five and seven, the Albuquerque fighter has always been just a step away from a big show. Stay tuned to Southwest Fight news for the end-of-week event coverage for Legacy FC 30. As always, we encourage fight fans to come out and support the locals and the event. This will be Legacy FC’s first event here in New Mexico and a welcoming crowd should entice them to bring their successful events back to the area. The promoters for the event are mentioning ticket sales are reaching capacity and if you aren’t able to make the show, make sure to tune in to AXS TV Friday night at 7 PM.